Henrico Too Smart 2 Start Coalition is a 501 (C) 3 Non-Profit Organization that promotes health and wellness in Henrico County with a primary focus on reducing youth substance abuse through education, advocacy and capacity building. 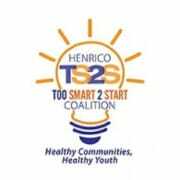 Henrico Too Smart 2 Start Coalition is a 501 (c) 3 Non-profit organization that will significantly help Henrico County, VA become a healthier community by significantly reducing youth substance you. HTS2S will achieve this by ensuring all community stakeholders, especially youth, are involved in developing initiatives that will lead in changing the views, behaviors and laws toward youth substance youth. Some of the initiatives will involve, but not be limited to community conversations, social media campaigns and interactive events that will educate and inspire the community. Would you recommend HENRICO TOO SMART 2 START COALITION?